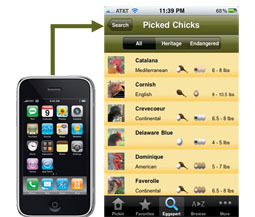 In response to the chicken movement sweeping the United States, Mother Earth News and Funny Farm Industries recently launched the Pickin’ Chicken app, a downloadable iPhone application that will help everyone from full-time farmers to backyard chicken enthusiasts research breeds from their iPhones, iPads, or iPods. Keeping chickens is becoming as mainstream as having a cell phone, so why not make chicken breed information easily accessible to the technologically savvy? The new application features an illustrated guide to more than 75 chicken breeds and 100 varieties with 250-plus photos. Users can find the ideal chicken breed for eggs, meat, personality, or any combination based on results from 14 searchable characteristics. ALBC worked with the creators of the app to include the ALBC conservation priority status of any endangered chicken breeds. When a user opens a profile for a specific breed, the CPL status is listed, and they are linked through to the ALBC website. This is a great way for ALBC to reach a new generation of chicken fanciers. If you have an iPhone, you can download the app for $2.99 from the Reference section of the Apple App Store. Not an iPhone user, check out ALBC’s Pick-A-Chick chart to review similar breed selection information. 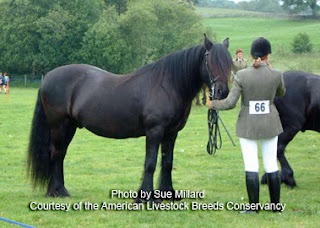 The January/February issue of the ALBC News has a great article about the Fell Pony and how the breed type is changing due to the various jobs it is expected to do. The author of the piece, Jennifer Morrissey, suggests that this change in breed types is "ok" so long as the original type is preserved. As agriculture changes, breeds are adapting to new demands which often means the breed type evolves. Morrissey looks at the impacts of this shift in breed type, and what it means for conservation. This is just one of many articles that is regularly published in the bi-monthly ALBC News. This newsletter is a full-color, 20-page piece that features articles about rare breeds of livestock and poultry. Learn from the experts and the newbies! To get the ALBC News delivered to your door, join the American Livestock Breeds Conservancy.